People are talking more and more about abolishing war and redirecting the mis-invested wealth into renewable energy, healthcare, bioremediation, public transit, etc. We need vast resources to address (embrace?) this climate-change-framed historical moment. As it happens, vast financial wealth has been and is currently being created by short-sighted, omnicidal industries. Perhaps this second vastness could cover the first. The student-led fossil fuel divestment movement has already succeeded in securing divestments totaling over $50 billion. The 2015 U.S. “Defense” budget was $1.3 trillion, according to the War Resisters League pie chart. How could the next $1,300,000,000,000 be better invested? 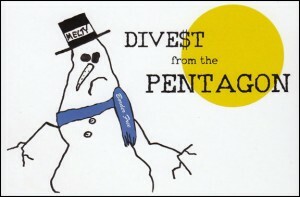 Do you want to divest from the Pentagon? 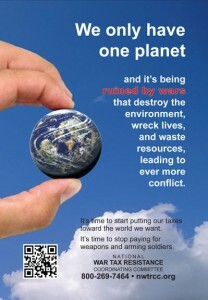 Get started with war tax resistance and spread the word! Contact the NWTRCC office to order a stack of our Earth cards (pictured to the left) to distribute, or share this article from our website. Climate Change Challenges: Support the Environment or the US Military? Why is the Pentagon Never Called Out on Its Carbon Footprint?